Applications on the prescribed form are invited for the following Postgraduate courses for the academic session starting from 1st July, 2014. - BDS from the recognized University with one year experience from a recognized hospital/Institute. will be allowed as per rules. DENTAL (SURGEON) - (1 No. 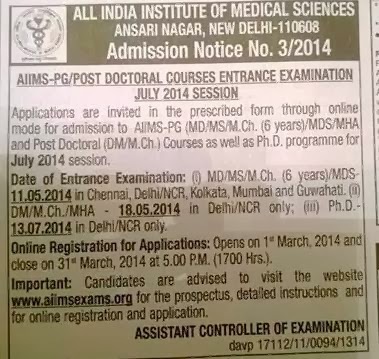 ):- On MECON contract Candidates should have completed BDS/MDS from institute recognized by Dental Council of India. Preference will be given to candidates who have worked in Govt., CPSU or large Hospital. Experience : Candidates should have minimum 03 years work experience Govt./ PSU/ Corporate Hospital/ Other Hospital of repute, 02 years for MDS. Remuneration & Perks : Compensation package would be commensurate with experience. Posting : Ispat Hospital Age Limit : Upper age limit for General Category candidates is 35 years as on 31.01.2014. Relaxation in age will be allowed in case of SC/ST/OBC & PWD candidates in conformity with the directive of Government of India.